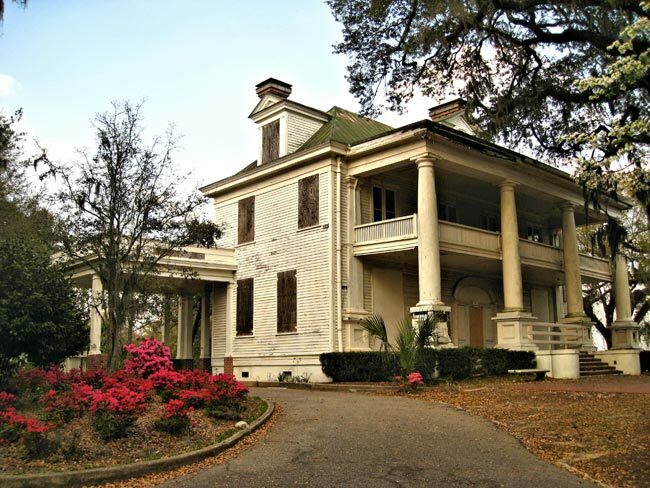 This Neo-Classical manse, locally known as the Admiral’s House, stands at the former Navy Base in North Charleston. 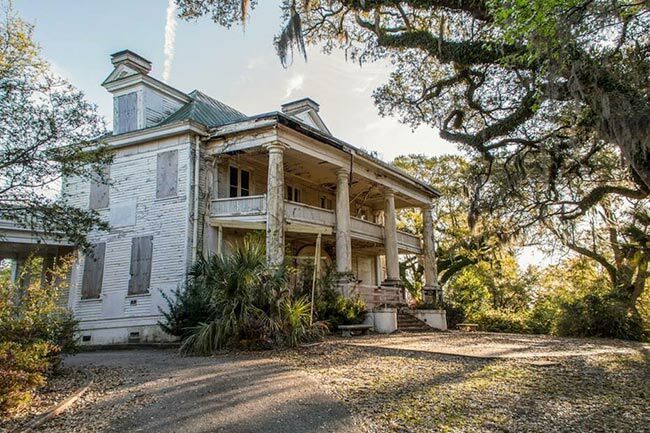 It was built in 1905 for the Commandant of the Charleston Navy Yard. Officially called Quarters A, the house boasts features that are indicative of its residents’ high rank. The area designated as the Officers’ Quarters District was previously part of Chicora Park, a public park designed in 1896 by landscape architects John and Frederick Olmsted, sons of Frederick Law Olmsted, Sr., designer New York’s Central Park. The Admiral’s House sits on a spacious lot on a hill, as do the homes of other high-ranking officers, looking over the quarters of lower-ranking officers which were built on smaller tracts below. A flagpole erected at Quarters A in 1943 distinguished the home as the Commandant’s, as did an anchor from World War I that marked the driveway. The flagpole remains in the front yard today, but the anchor has been moved. Though the 7,391-square-foot house is Neo-Classical in style, it also bears some elements common to the Victorian era, such as asymmetry. Servants’ quarters – called stewards’ quarters – exist within the home as well as in separate outbuildings on the grounds. Also near the grounds of Quarters A stands a rectangular, windowless building of English bond known as the “Dead House,” possibly dating from the mid-to-late eighteenth century. Some believe the dead were stored here prior to burial, though others think the small brick building may have been a powder magazine. 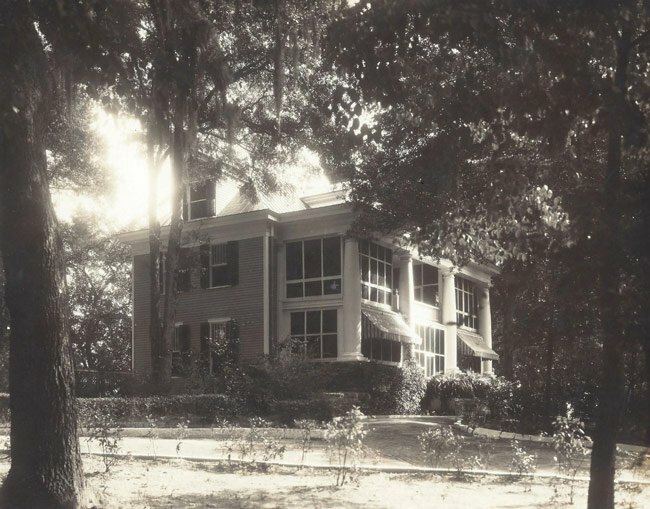 Changes and additions were made to the home in the 1930s and 1940s; screens were added to the verandas in the early 1930s and an entire screened-in porch was added to the rear service wing in 1945. 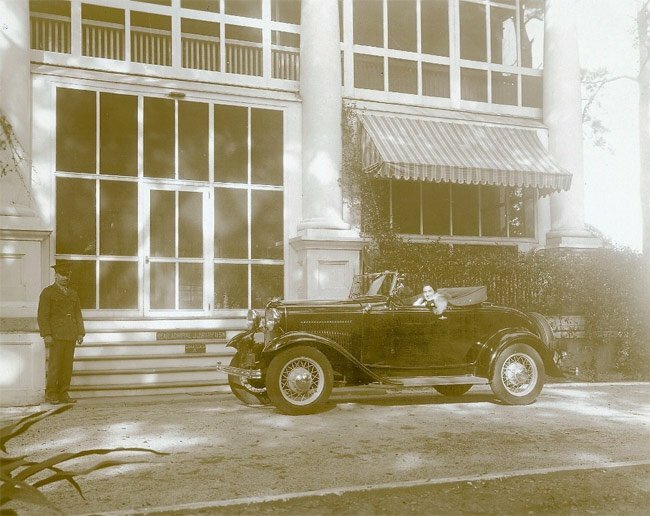 The porte-cochere was built in 1943, and the first floor received central air conditioning in 1944. The screens were removed in 1996. Two historical photos shared from Cathleen Philip, whose mother lived in the Admiral’s House from 1931 through 1934, can be seen below. After the Navy base closed in 1996, this home and other buildings on the former base sat vacant, many eventually falling into disrepair. Quarters A, along with much of the former Navy Yard, was purchased by The Noisette Company – a development group – after the base’s closure. The company foreclosed, however, and the former Noisette properties were purchased by the State of South Carolina with the intention of using the land to construct a new intermodal railway for transporting containers. The City of North Charleston strongly opposed the new railway, citing a reduction of both property value and quality of life. After negotiations, a settlement was reached in 2012 between the city and the state. 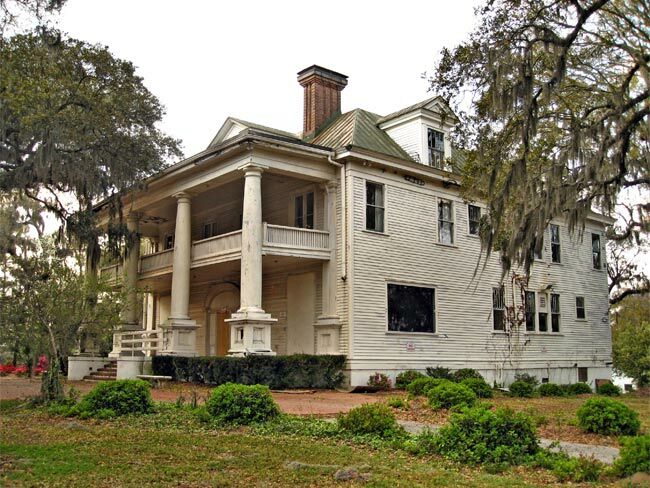 Though a new railway will be developed on the old base, the Admiral’s House and several other historic properties are now owned by the city, which plans to preserve them. 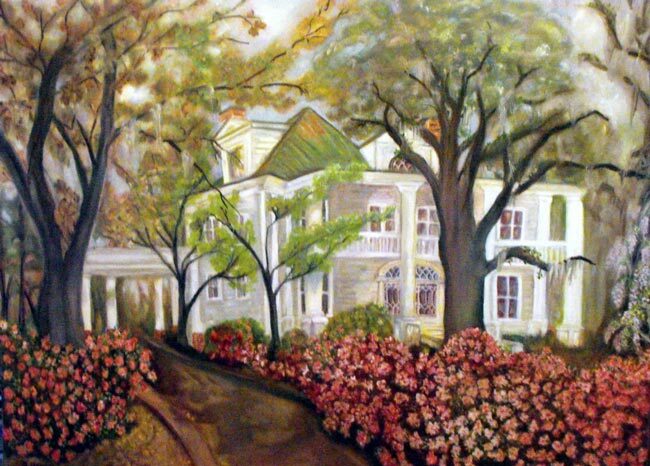 The Admiral’s House, as well as Quarters K, are slated to serve as event venues. 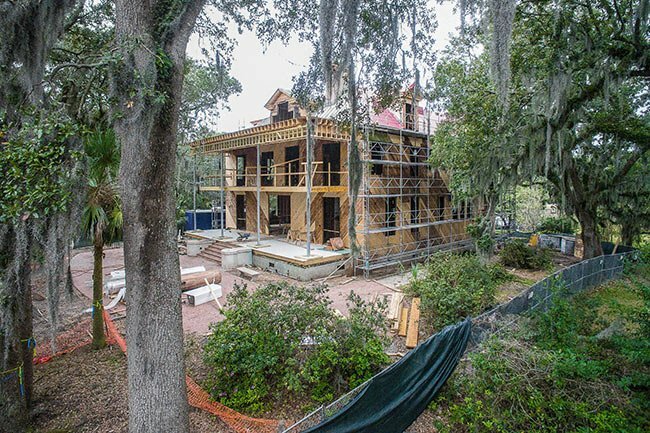 As of Early 2019, a complete renovation project, projected to total more than $4 million, has started on the Admiral’s House. Woodwork, moldings, doorways, windows, and columns have been removed to stabilize the structure and will be reinstalled as work progresses. 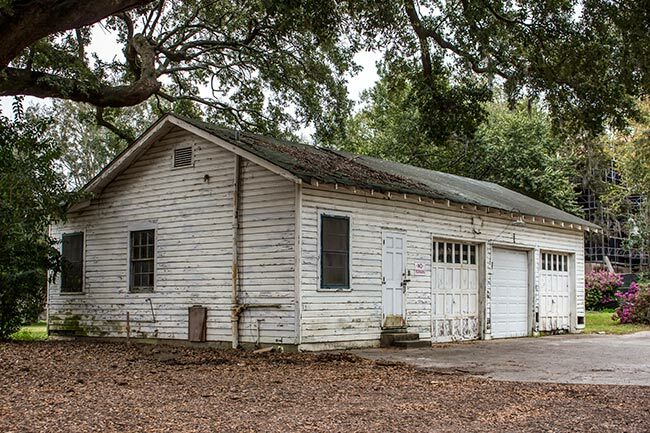 Located between the Cooper River and the rear of the home stands the old garage building. Each officer’s quarters had a contributing dependency with these garage buildings as they featured living or servants quarters. Also of interest, the home was featured in the film, The Notebook, as was its neighboring structure, the Eternal Father of the Sea chapel. 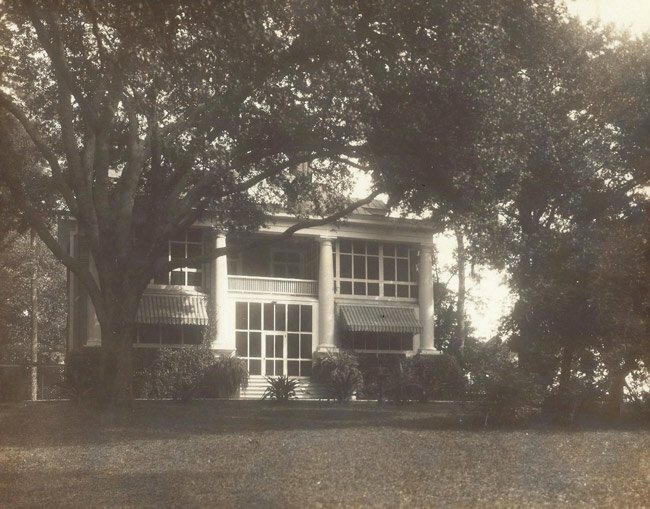 Two and one half-story Neo-Classical style, irregular L-shaped building, with a hipped standing seam metal roof penetrated by three interior brick chimneys, south facing double veranda with full height monumental Tuscan columns. Quarters A was one of the first construction projects after the Navy established the yard. Under an act of July 1902, $12,000 was appropriated for the construction of quarters for the Commandant of the Charleston Navy Yard.7 Construction of the quarters commenced in 1904 and was completed in 1905. Located on top of one of the highest hills, the building faces south. The 7,391-square foot mansion is a two-and one/half story, wood-frame building with an irregular plan and partial basement. The exterior walls are sided with weatherboards and are supported by a concrete foundation with brick piers that have been infilled with masonry and stuccoed. A hipped standing seam metal roof covers the main rectangular mass of the building; an intersecting hip extends from the northeast elevation’s façade creating a rear two and one half-story “kitchen wing” ell. The rear service wing has a 1945 one-story screen porch facing north and a basement laundry. Corbelled chimneys rise from the roof of the main building mass and have stone chimney caps. A shed roof extends from the front of the primary elevation, covering the south-facing two-level full width veranda. 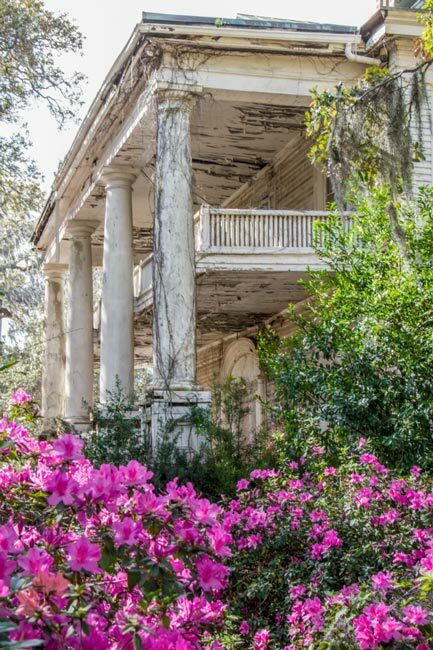 Four full-height monumental Tuscan columns on plain plinths and paneled wood bases support the roof of the veranda that likewise contains monumental Tuscan responds [pilasters] on its outer edges. The central brick stairs, added in 1938 to replace original wooden steps, rise between stuccoed masonry bulkheads, also added in 1938 to replace original wooden bulkheads. The second level veranda has a simple square picket railing that runs behind the columns. Both levels were screened in 1944; the screens were removed after 1996. A high one-story porte-cochere was added in 1943 to the rear northwest corner, with a shed roof with raised parapet ends and square piers on simple raised red brick plinths or pedestals. 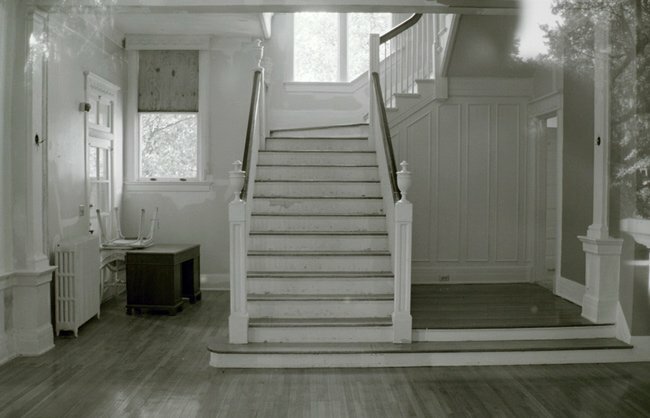 It is attached to the northwest rear of the main house and is connected to a 1943 secondary entrance at the north elevation’s projecting stair hall with a covered wood porch and wood stair that descends to the rear drive. The square picket railing matches that of the main veranda. The rear entry forced a major change to the interior main stair. While the rear kitchen ell is original, the wide flight of wooden and concrete stairs and the existing one-story rear screen porch were extended in 1945 (the original rear porch and steps were on the side). The wood railing has a classical cross and diagonal pattern seen in many of the finer designs of the officers housing and institutional or industrial buildings of the adjacent historic Charleston Navy Yard District. The main roof has four large dormers with standing seam metal roofs. The triple dormer lights at the east and west dormers are of an eight-over-eight light configuration. A Palladian style double-hung window graces the larger front dormer and has the same decorative muntin design as the first floor main entry’s semi-elliptical fanlight and sidelights. A large hipped dormer with three sashes provides access to the third floor attic servants’ or steward level at the main house’s north elevation. The kitchen ell has two dormers with four-over-four-light windows at the north and east. The primary entrance opens off the front veranda; it is a single one-light wooden door with sidelights. The sidelights have diamond basketwork glazing above a molded panel and flank the doorway. A semi-elliptical transom with the same diamond basketwork glazing extends above a heavy transom bar and rests on small-engaged Tuscan pilasters. Decorative moldings surround the entry. Symmetrical placed French doors (originally termed French windows) each with two lights over a bottom flat panel open off of the principal rooms of the first and second level verandas. Fenestration on the other main elevations is asymmetrically placed, with six-over-one-light, five-over-one-light, and three-over-one-light vertical wooden double hung windows. The six-over-one-light sash’s multi-paned upper sash, are actually composed of six centrally placed lozenge shaped vertical divisions whose muntins cross to form small triangular shaped glazing pattern next to the top and bottom rails. A large plate glass “scenic window” replaced the original fenestration at the dining room’s first floor east elevation in 1944. 8 Other decorative elements include a continuous wooden cornice and full-height pilasters on paneled plinths at the veranda corners. It should be noted that central air-conditioning was added to the first floor in 1944. The house was constructed with an underground rear cistern and was designed with electric wiring and lights that date form 1905. Servant’s quarters, often referred to as steward’s quarters in the Navy, exist both in the house and in structures detached from Quarters A. To the rear of Quarters A is a contributing garage and servants’ quarters. I would appreciate a copy of this article. I would also like to visit the site and tour the homes. Finally, any updates to this article would be appreciated. So much history and would love to see on tour one day and the other quarters!